Secularism should not mean the death of true religiosity; instead, a truly religious mind strengthens positive and enabling secularism - the spirit of plurality and inclusiveness, the principle of non-discrimination, and the dignity to every soul, irrespective of birth and location. 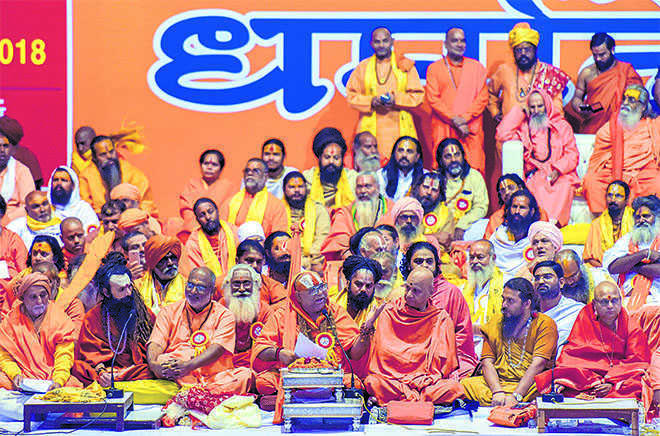 Not religious: Even when Hindutva speaks of ‘sadhus’ and ‘gurus’, its primary intention is not to elevate man. With the loud assertion of Hindutva — a totalitarian doctrine that negates the inherent plurality in the broad landscape of Hinduism, and transforms it into an instrument of emotive mobilisation for strengthening militant nationalism — many of us experience the death of life-affirming religiosity: love and connectedness, and sublime prayers and a quest for the ocean of compassion. Instead, we begin to breathe violence. An epic like the Ramayana with subtle meanings relating to love and sacrifice, sattvic calmness and demonic aggression, and masculine pride and feminine resistance is reduced into narrow/egotistic politics; and a temple is no longer a site of meditative communion with the divine; instead, it ought to satisfy the narcissistic will of a brigade of politicians and 'sadhus' engaged in an act of historic revenge: giving the appropriate lesson to the 'alien invaders'. No wonder, the language they use becomes terribly violent. The Supreme Court is seen to be 'anti-temple'; and as the Prime Minister has already been regarded as the 'incarnation of Lord Rama', Hindus, we are told, are losing their patience, and the temple at the disputed site has to be constructed at any cost. This crowd mentality (think of Amit Shah's fiery speech in Kerala) is the brute assertion of power that does not mind to defy even the sanctity of the Supreme Court. This is really frightening. There are three reasons why we ought to resist the politics of Hindutva. 1 It is inherently anti-democratic because it is based on the principle of exclusion. Enough has already been said about ideologues like Golwalkar and Savarkar — the way they saw the Muslims and Christians as 'alien intruders', and in this act of othering, there was no possibility of what Tagore with his poetic wisdom imagined — India as an ocean, a confluence of multiple traditions, faiths and religions. Not solely that. Like any other fundamentalist doctrine, it excludes even those 'Hindus' who think differently and believe in pluralism and constant cross-religious conversation. In fact, we cannot make sense of the assassination of Gandhi without understanding the practice of violence and exclusion implicit in Hindutva. 2 Its social conservatism, despite its close affinity with the neoliberal market economy, goes against the voices of the marginalised: lower castes and women. As a matter of fact, its patriarchal/hyper-masculine/hierarchical character cannot be evaded even when it speaks of the integration of the marginalised into its own fold. 3 It transforms religion into despiritualised crowd behaviour. A meditative/reflexive mind striving for a meaning of existence with its rhythm of life and death is not what it wants. Instead, to be a 'Hindu', for them, means to wear a uniform, hate others and equate nationalism with a singular belief. Even when it speaks of 'sadhus' and 'gurus' (or mahants, priests and television-induced celebrity babas), its primary intention is not to elevate man, as Sri Aurobindo imagined, to a higher level of psychic/spiritual evolution; it demands conformity and gross emotions. Well, this does not mean that there be a soulless secularism, or some sort of scientism with its inherent disenchantment. Instead, Nachiketa's quest for understanding the meaning of death (as the Katha Upanishad depicts so beautifully), Buddha's reflections on dukkha or suffering emanating from our attachment to all that is temporal, and the ecstasy of love that the likes of Nanak and Kabir radiated, enable us to live differently, meaningfully and peacefully. Secularism should not mean the death of true religiosity; instead, a truly religious mind strengthens positive and enabling secularism — the spirit of plurality and inclusiveness, the principle of non-discrimination, and the dignity to every soul, irrespective of birth and location. Gandhi and Tagore were striving for this possibility: something qualitatively different from the doctrine of assertive Hindutva, or, for that matter, any other form of fundamentalism, be it Islamic or Christian. Gandhi didn't escape from religion. As a matter of fact, as he chose to transform the political realm into the field of his sadhana, he added yet another meaning to secularism. Cross-religious dialogue, constant experiments with truth, resisting all sorts of communalism, and seeking to spiritualise politics through satyagraha and nishkam karma: these principles made him strive for an inclusive idea of India — so different from the 'two-nation theory' propagated by the likes of Savarkar and Jinnah. Likewise, Tagore's religiosity was a quest for the 'surplus' of man — an aesthetic connectedness with nature as a manifestation of the divine, and seeing the light of the infinite in the finite. No wonder, his politically and spiritually mediated essays on nationalism continually reminded us of the devastating consequences of a totalitarian ideology, a doctrine that sanctifies the machinery called the 'nation', promotes group narcissism and violence, and diminishes the spirit of human creativity. It is sad that we have lost our priorities. See the degeneration of the public debate. The nation, a loud television anchor announces, wants to know the gotra of Rahul Gandhi to examine whether he is truly a Hindu. Or think of the politics of appropriation: from the record-breaking 'Statue of Unity' to the rhetoric that 'Vivekananda, Subhas Bose, Bhagat Singh and Ambedkar — they belong to us'. Yet, we continue to see street children in the national capital begging; we see women being violated every day; we see schools without teachers; we see the erosion of the legitimacy of all major institutions — from the RBI to the CBI; and we see the proximity of the ruling regime with the not-so pious corporate bourgeoisie. And under these circumstances, the proponents of Hindutva tell us that the construction of the Ram temple at Ayodhya ought to be the first priority of the nation. What do we do? Do we laugh at this absurdity? Or do we cry for this degeneration: the death of emancipatory religiosity from the dominant political discourse?